Apple has updated Migration Assistant in preparation for Mac OS X Lion’s release today. Migration Assistant is an Apple tool to help move your data and settings to a new Mac. Migration Assistant Update for Mac OS X Snow Leopard addresses an issue with the Migration Assistant application in Mac OS X Snow Leopard that prevents transfer of your personal data, settings, and compatible applications from a Mac running Mac OS X Snow Leopard to a new Mac running Mac OS X Lion. 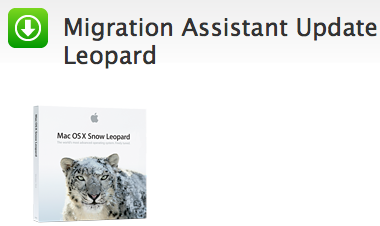 To download the update from Apple: Migration Assistant Update for Mac OS X Snow Leopard.